Mr. Reilly has a working knowledge of Nevada’s political and educational landscape and has the integrity and leadership skills to succeed. 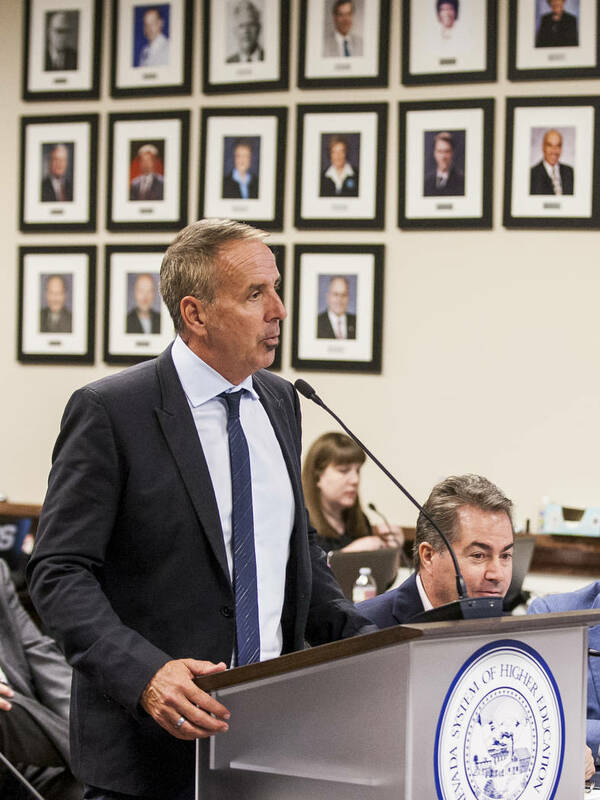 The state regents voted unanimously Tuesday to name Thom Reilly as chancellor of the Nevada System of Higher Education. It’s an excellent choice. Mr. Reilly is a familiar face. From 2001 to 2006 he served as manager of Clark County. He returns to the state from Arizona, where he ran Arizona State’s Morrison Institute for Public Policy while also serving as a professor of public affairs at the school. Mr. Reilly has a working knowledge of Nevada’s political and educational landscape and has the integrity and leadership skills to succeed. Mr. Reilly’s hiring should go a long way toward repairing the university system’s frayed relationship with state lawmakers. The previous chancellor, Dan Klaich, left under fire last year after emails showed he worked to undermine the Legislature’s efforts to tweak and reform the state’s higher education funding formulas. The deception angered lawmakers and created a climate of distrust that lingered throught the 2017 session. Also on the plus side of the ledger: Mr. Reilly is a straight shooter who understands the importance of public-sector transparency and accountability. The university system has at times over the years exhibited an imperial attitude of indifference toward the state’s open meeting laws. It’s unlikely Mr. Reilly will tolerate any such nonsense. We would also expect him to be a vigorous supporter of free speech and expression on campus. Mr. Reilly’s fiscally conscious approach will be an asset. It’s worth noting that he has authored several published works questioning the long-term fiscal prudence of lavish government pay and retirement benefits, most notably 2012’s “Rethinking Public Sector Compensation: What Ever Happened to the Public Interest?” Such a refreshing perspective has too often been sorely lacking among the state’s policy elites, notwithstanding Mr. Reilly’s eye-opening $425,000 salary. Mr. Reilly faces a number of challenges, not the least of which is improving the system’s academic reputation and dealing with a state public school system — particularly in Clark County — that is producing far too many graduates who are wholly unprepared for the next level. In addition, he takes over at a time when many observers are questioning the value of a college degree and whether the nation’s higher education model can survive outside a handful of prestigious institutions. But Mr. Reilly’s distinguished pedigree offers hope that he will be able to clear these hurdles and make significant and innovative strides toward upgrading the state’s higher education offerings.